GLENDALE, ARIZONA – Arizona Coyotes President of Hockey Operations & General Manager John Chayka announced today that the Coyotes have acquired forward Vincent Hinostroza, defenseman Jordan Oesterle and Chicago’s 2019 third round draft choice in exchange for Marcus Kruger, Jordan Maletta, Andrew Campbell, MacKenzie Entwistle and Arizona’s 2019 fifth round draft choice. The Coyotes also acquired the contract of forward Marian Hossa. The 5-foot-9, 172-pound Hinostroza registered 7-18-25 and 10 penalty minutes (PIM) in 50 games with the Blackhawks last season. The 24-year-old forward also recorded 9-13-22 and eight PIM in 23 games with Rockford (AHL). The Barlett, IL native has tallied 13-26-39 and 33 PIM in 106 career NHL games with Chicago. He was originally drafted by the Blackhawks in the sixth round (169th overall) in the 2012 Entry Draft. The 6-foot, 183-pound Oesterle registered 5-10-15 and eight PIM in 55 games with Chicago in 2017-18. The 26-year-old defenseman has recorded 5-16-21 and eight PIM in 80 career NHL games with the Blackhawks and Edmonton Oilers. The Dearborn Heights, MI native tallied an assist in one game and earned a bronze medal with Team USA at the 2018 World Championships. The 6-foot-2, 207-pound Hossa did not play in 2017-18. The 39-year-old native of Stara Lubovna, SV has registered 525-609-1,134 and 628 PIM in 1,309 career NHL games with the Blackhawks, Detroit Red Wings, Pittsburgh Penguins, Atlanta Thrashers and Ottawa Senators. Kruger recorded 1-5-6 and 28 PIM in 48 games with the Hurricanes in 2017-18. He has totaled 34-77-111 and 204 PIM in 446 career NHL games with the Blackhawks and Carolina Hurricanes. 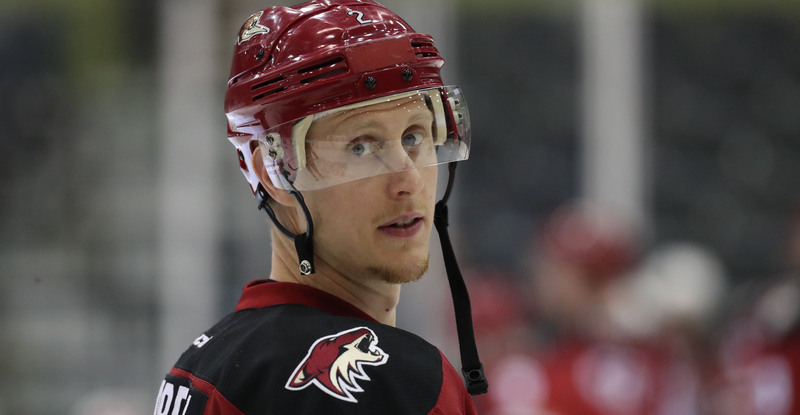 Campbell registered 2-4-6 and 44 PIM in 60 games with Tucson (AHL) last season. He has tallied two assists in 42 career NHL games with the Coyotes, Los Angeles Kings and Toronto Maple Leafs.